ERA fabric map gives a snapshot of the ERA today. It looks at the division of responsibilities between EU and Member States, and at institutions and bodies involved in the European research system. Starting from the six ERA dimensions described in the ERA Green Paper, the report then looks where we are today, and which direction the future is taking, given the policy context of Europe 2020. Involvement of stakeholders in further building the ERA is looked at by analysing their involvement in a number of existing ERA instruments, using a taxonomy of stakeholder roles and functions. 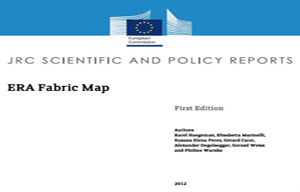 The report (D6.1) has been written as part of the FP7 project Forward Visions on the European Research Area (VERA). This first edition will be updated twice as part of the VERA project. The publication (pdf) is available here.